I recently started to eat Keto friendly foods over the past month and discovered a ton of recipes and a wealth of information. I even sneak some of them into our family dinners. My kids and husband not only were surprised when they found out about the substitutions but now they actually do love Keto. Taco Zucchini Noodles are one of the very recipes I found. Pasta and tacos are two of my family’s favorite foods to eat. I was so excited when I found a recipe that combined the two with a small twist. Zucchini noodles are an excellent substitute for pasta noodles. This recipe not only tastes delicious, but it is very easy to make and does not take a long time. In my household prep and cooking times are critical since the kids have some type of practice all the time. Keep this recipe on hand, if you are in a similar situation. 2 large zucchinis- have to be spiralized! 1. Add olive oil to your skillet or a large pan. Set on medium-high heat. Add in the zucchini noodles. Cook the noodles until water is released by the zucchini. Drain out the water and take the noodles out of the pan and set to the side. 2. Add ground turkey, onions, and garlic to your skill. Cook your turkey until it is browned; crumble the ground turkey while you are cooking it. Drain the excess fat out. 3. Sprinkle taco seasoning right on top of your browned turkey. And 1/4 cup water and diced tomatoes (which includes the liquid); sir into your turkey mixture. Add to medium heat and cook until everything has been mixed evenly and stir it occasionally. Be sure the turkey is cooked all the way through and the sauce is thickened. 4. Turn down heat to low and then add in the zucchini noodles. Toss the zucchini gently into the sauce. 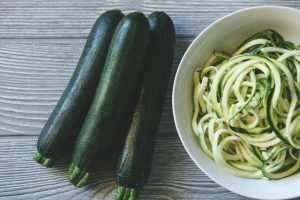 It can be tricky since you need to be careful to not cook your zucchini any further or more water will be released by the noodles. That will then make the sauce watery and you do not want this to occur. Sprinkle cheese on top of the pasta and turn off the heat. Cover up the pan with the lid until the cheese has thoroughly melted. After the cheese is melted the dish is ready. You can squeeze some lime juice on top if you want and garnish with cilantro. My kids are picky eaters so we let them plate their own food and add the cilantro and/or lime. That has worked out ideal for us. However, you might want to add these before plating the food. After plating all you need to do is enjoy! I recently started to eat Keto friendly foods over the past month and discovered a ton of recipes and a wealth of information. I even sneak some of them into our family dinners. My kids and husband not only were surprised when they found out about the substitutions but now they actually do love Keto. Taco Zucchini Noodles are one of the very recipes I found. Pasta and tacos are two of my family’s favorite foods to eat. I was so excited when I found a recipe that combined the two with a small twist. Zucchini noodles are an excellent substitute for pasta noodles. This recipe not only tastes delicious, but it is very easy to make and does not take a long time. In my household prep and cooking times are critical since the kids have some type of practice all the time. Keep this recipe on hand, if you are in a similar situation. Add olive oil to your skillet or a large pan. Set on medium-high heat. Add in the zucchini noodles. Cook the noodles until water is released by the zucchini. Drain out the water and take the noodles out of the pan and set to the side. Add ground turkey, onions, and garlic to your skill. Cook your turkey until it is browned; crumble the ground turkey while you are cooking it. Drain the excess fat out. Sprinkle taco seasoning right on top of your browned turkey. And 1/4 cup water and diced tomatoes (which includes the liquid); sir into your turkey mixture. Add to medium heat and cook until everything has been mixed evenly and stir it occasionally. Be sure the turkey is cooked all the way through and the sauce is thickened. Turn down heat to low and then add in the zucchini noodles. Toss the zucchini gently into the sauce. It can be tricky since you need to be careful to not cook your zucchini any further or more water will be released by the noodles. That will then make the sauce watery and you do not want this to occur. Sprinkle cheese on top of the pasta and turn off the heat. Cover up the pan with the lid until the cheese has thoroughly melted.